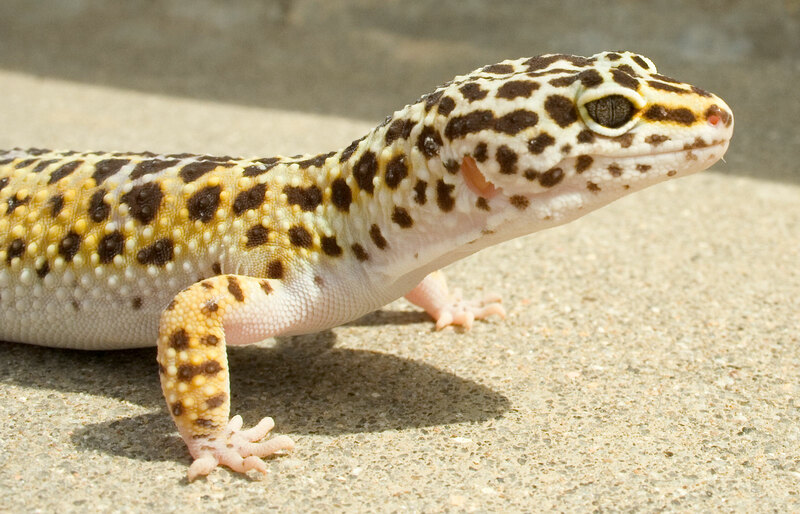 Leopard Gecko | Zoo Med Laboratories, Inc.
Leopard Geckos are among the most popular pet reptiles and are an excellent choice for beginner hobbyists. Leopard Geckos stay small, are very docile, and are relatively easy to maintain in captivity. These geckos are beautifully marked and have fascinating personalities. Over the years breeders have developed many different color morphs that have become available to hobbyists at all levels. Hatchling to juvenile Leopard Geckos can be housed in a 10 gallon terrarium. Young Leopard Geckos can be housed together. Adult Leopard Geckos will need at least a 20 gallon terrarium. Do not keep males together because they are territorial. Zoo Med’s ReptiHabitat 10 and 20 gallon terrariums are an excellent choice for Leopard Geckos. A Repti Shelter, Habba Hut, or Cork Bark will provide a secure hiding place to help reduce stress. Make sure that each gecko has a place to hide. It is important to create a thermal gradient in your terrarium. This can be accomplished by providing a Basking Spot Lamp and an Under Tank Heater on one side of the terrarium. By focusing the heating elements on one side of the cage, you will naturally provide the proper thermal gradient. Although these nocturnal animals will not generally bask, providing a basking spot will maintain proper temperatures in your terrarium. Any of Zoo Med’s thermometers will help you keep a close eye on terrarium temperatures. New studies have shown that Leopard Geckos will greatly benefit from exposure to UVB lighting. Leopard Geckos live in arid, sandy places in the wild and will do well on a variety of sand-type substrates in captivity. Hatchling Leopard Geckos will do best on Cage Carpet such as Zoo Med’s Eco Carpet or Vita-Sand®. Excavator® Burrowing Clay Substrate will allow you to create a naturalistic terrarium complete with burrows and tunnels for your animals. ReptiSand® and ReptiFresh® are excellent choices for housing Leopard Geckos. Leopard Geckos are insectivorous and will need to be offered a variety of insects to stay healthy. Insect size = width of gecko’s head. Leopard Geckos should be fed crickets or mealworms dusted with ReptiCalcium® and ReptiVite™ as directed. Always remove uneaten crickets after each feeding. Provide a clean water dish with fresh water at all times. Always add ReptiSafe® Water Conditioner to remove Chlorine and Chloramines.